Mail lines of the Imperial Posts crossed the State from an early date. The mail route from Bombay to Surat was introduced in 1796 and was extended to Deesa by about 1832. 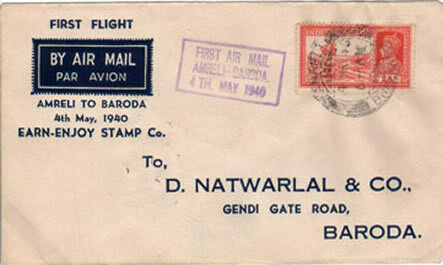 Mail lines between Broach-Deesa, Bhavnagar-Hursole, Baroda-Bhopawar, Cambay-Kaira and Gogo-Bhuj had been passing through Baroda territory since 1857. 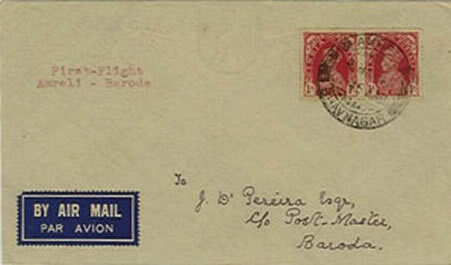 On establishment of post offices in Baroda territory, Borsad-Petlad and Baroda-Dabhoi mail lines were opened in 1863. Foot runners, horse dawk, camel dawk and boats were being used for the conveyance of mails. By 1880 there were 32 mail lines in the state, which increased to 43 by 1884. 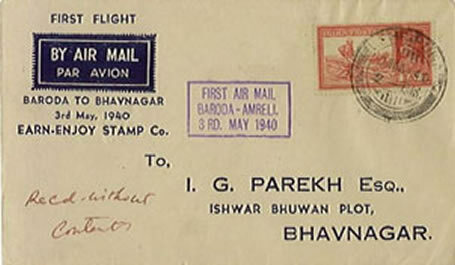 After the introduction of railway in the state, Baroda Government offered the use of GBS Railway for the conveyance of mail to postal authorities. From 1882 a Railway Mail Service began between Miyagam and Dabhoi. Such arrangements were made available for other railway lines opened later on in the state. 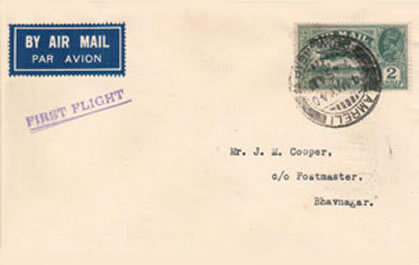 In 1923, BISN Company's steamers conveyed inland mails for and from Dwarka on experimental basis. 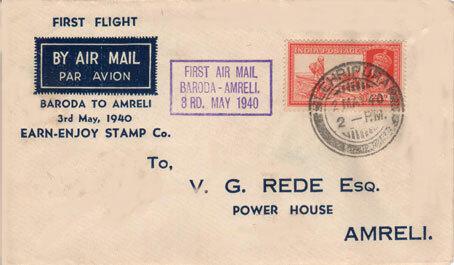 On introduction of air service between Baroda and Amreli, airmail service was started from Baroda to Amreli on 3rd May 1940. 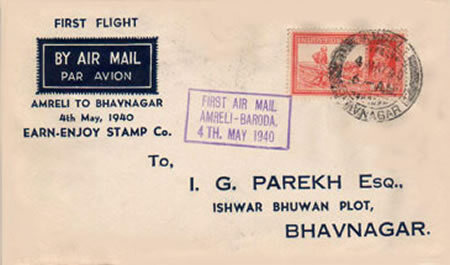 Private covers with First Airmail cachets are recorded from Baroda-Amreli, Baroda-Bhavnagar, Bhavnagar-Amreli and return. 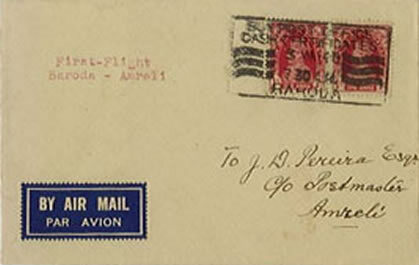 These covers are not considered as First Flight Covers as the air service was commenced from 14th November 1939. 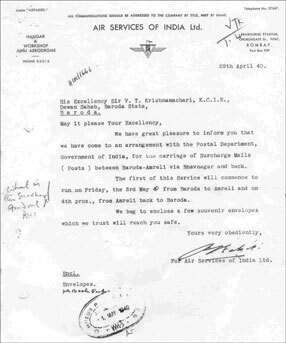 Note: There was a crash of aeroplane VTAEA on 14th May 1940, which took off from the Amreli for Baroda. While taking a turn round the aerodrome the plane nose-dived from a height of about 100 feet. The Ground Engineer Mr. S. V. Rehman died immediately and the pilot Mr. V. B. Bhate who was seriously injured died on 15th. 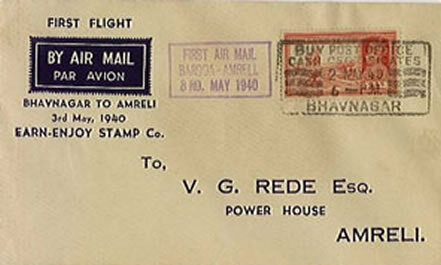 The postal articles, which the plane was carrying, were recovered intact and were handed over to the Postmaster, Amreli.